There's lots of talk about the new National Do Not Call List (DNC) in Canada. As a consumer, you're probably happy. What about advisors trying to make a living? Some are concerned. Others aren't. 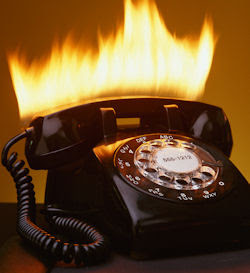 You don't want to ignore a phone call at night because it could be important. We'd get calls from fax machines calling our fax machine. We didn't have one. So they'd call back again and again thinking our machine ran out of paper. Office fax machines still spew garbage faxes. You pay for the paper and ink. How annoying. There was no easy way to opt out until now. On a random day, I saw 27 wasted pages. Email spam is annoying but it's easier to filter out --- 33 messages correctly tagged today. Telemarketing is the second worst pest. Calls at inconvenient times. Products and services you don't want or need. Those days are now gone (with some exceptions). There's no relief for the most annoying pest: door-to-door solicitors. Two cute kids rang our doorbell and asked us to buy popcorn to support a cause we never hear about. I took the catalog. How can you refuse? The prices were $45-$55 on the open page. Yikes! Saying no then became easy. You can easily joing the National Do Not Call registry. Online, you enter your phone number and confirm you're a human by typing an onscreen code. Here's the surprise. You don't even need to prove the phone number is yours. If you're not getting enough telemarketing, maybe someone opted you out. An act of random kindness. With every wish there comes a curse. Old techniques like cold calling may be dead. Advisors are generally told that they cannot call on behalf of a company and if they do, they'll pay the entire fine of $16,500 per incident. Ouch! Suppose you're my advisor and I give you a referral. If you phone, you're telemarketing and you don't have permission. I'd have to call on your behalf or you could send them a letter. Businesses seek ways to encourage you to contact them. We're already smothered by advertising but expect more. From those willing to spend. Insurance reduces risk and provides peace of mind. We insure our lives, our cars, our homes. What about insuring our livelihood/income/job? Companies disappear and you could be in the wrong spot. What can you do? You can make yourself more employable by improving yourself. This doesn't guarantee success but certainly improves the probabilities. Over the years, I had staff seeking promotions or raises because they wanted more money. Or thought they did great work. Or thought they were indispensable. Those aren't good reasons. To earn more, do more than you're paid for. This applies whether times are good or bad. Since we see better than we think, impressions can mean more than facts. If we act like winners, we get seen as winners and can become winners. Acting like a survivor helps you survive and become a survivor. Overcoming impressions takes time, during which we can improve our skills. Survivors look forward to the future. The best way is by focusing on your customers, anticipating their needs and then satisfying them. Your customers can be inside or outside your organization. By proving your worth, you build your future at your company --- or another. How versatile are you? If you've built and maintained portable skills, you're valuable wherever you go. You might even find the courage or opportunity to do something fresh and more rewarding. For years, I developed/launched/marketed life and health insurance products. After "harmonization" into our much larger parent company in 2005, my role became redundant. Although I had no experience outside the "ivory tower", I eagerly switched to working with advisors and clients in the field. This new role is much more satisfying because I'm helping people directly and quickly. How true. Leaders are people too. Chopping staff is not easy. As a head office actuary, I had to cut five from my team of ten during integration with the parent. Fortunately, their strong skills helped them land new positions. Likable trumps capable? That's tough to accept. But true. I learned this at The University of Western Ontario in 1984. Of the seventeen graduates in actuarial science, only four of us got job offers. What a shock since grads usually got multiple job offers. Three of us were the top students and got the best offers. The fourth was average but the most likable, which grads with higher grades found "unfair". I just checked the actuarial directory and don't see #4 listed. He probably failed the exams that lead to an actuarial designation and quit. Being capable also matters. I don't remember, I don't recall. I got no memory of anything at all. Life gets complicated and sometimes you forget basics like getting milk. You need a system. 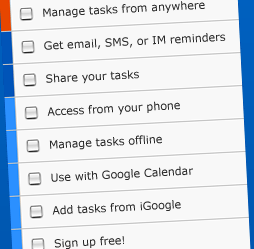 That post lists various tools, including my favourite task manager. I've used different tools over the years. Paper is certainly available offline but where's your backup and how to you search for items? Microsoft Outlook looks ideal but has limited features and feels cumbersome. Google provides a virtual office with email, a calendar, and shared documents. But no task manager !?! Through Lifehacker, I discovered a nifty Australian website called Remember The Milk. With that name and the drawing of a cow, you know you're going to have a nice experience. You're right. Even the font feels friendly. Other task managers feel daunting and judgemental. When you fall behind, you feel like you're being scolded. As the unfinished tasks pile up, it's easy to get overwhelmed and give up. Not with RTM. The cow is so inviting and nonjudgemental that you feel like coming back and getting on track. There are many other sites that explain how to use Remember The Milk. I wanted to follow the Getting Things Done (GTD) methodology. That means transferring all current and future tasks from my head into a trusted system. RTM "supports the five GTD workflow phases (Collect, Process, Organize, Review, and Do) in a seamless, automatic way" and this article from an expert user explains how. You can access Remember The Milk in many ways. I use the website, iGoogle, Google Calendar, Blackberry and offline with Google Gears. When I think of a new task --- even if years away --- I send an email to my RTM Inbox for later categorization. I send tasks to family members and we even haved several folders of shared tasks. Each morning, I get an email showing the day's tasks. I sometimes printout the tasks for the upcoming week. Beautiful. You know how the Internet has wacky business models? Well, Remember The Milk offers lots for free and doesn't even have ads. What good is remembering the milk without money to buy any? I upgraded to a Pro account for $25/year for thanks giving. Keeping Promises: Do You Care About Corporate Governance Scores? 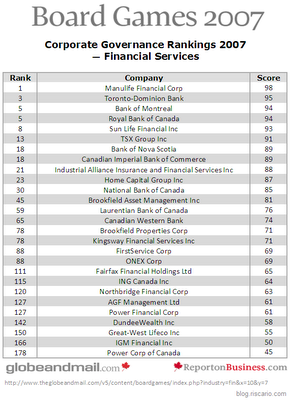 We looked at the top life insurers by revenue, ranked by The Financial Post 500. Financial measures don't tell the whole story. This time we turn to the Globe & Mail which looks at Corporate Governance. Highest doesn't mean best (recall GM vs BMW) but higher means better. Here's the full list, and a summary in table at the right (click to enlarge). Here's the shock. Some big names don't even make the top 100!?! Maybe Canadians don't care — or are unaware — of the immense swings.